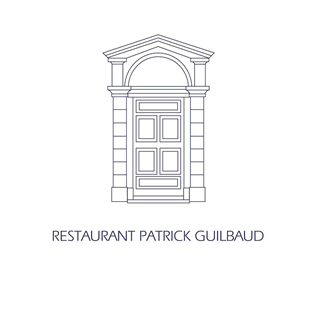 Restaurant Patrick Guilbaud has been a centre of fine dining in Dublin for the last thirty-five years and is Ireland’s only two star Michelin. 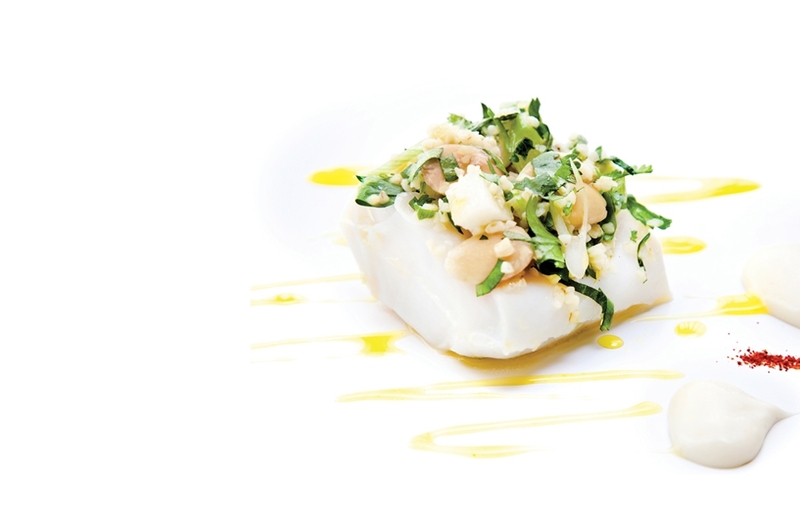 Situated beside the 5 star Merrion Hotel in Dublin city centre, the cuisine is contemporary Irish with classical roots. Having featured in everything from the Irish Times to the New York Times, it is renowned as one of the best restaurants in Ireland and is also internationally acclaimed. 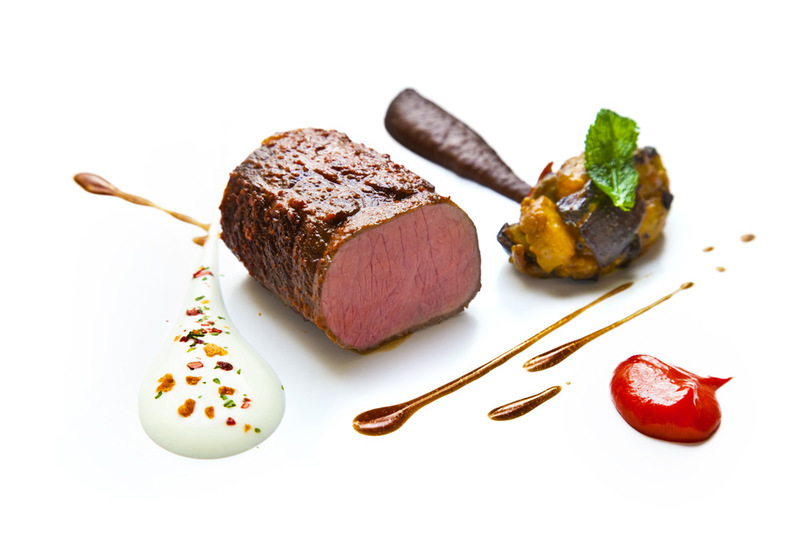 The RPG philosophy is simple: it is about delivering impeccable dining experiences. We look forward to welcoming you. 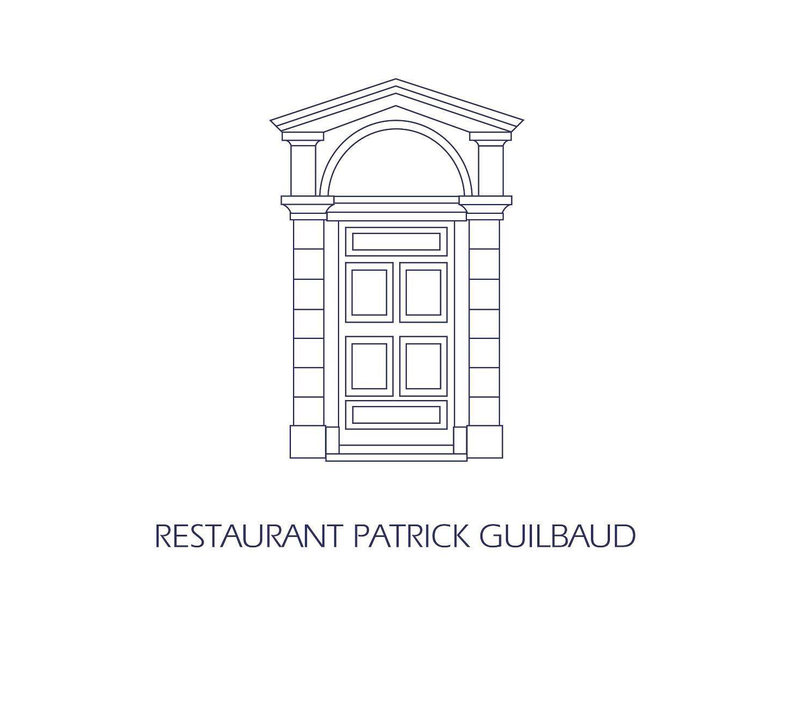 Patrick Guilbaud's eponymous restaurant opened in 1981. 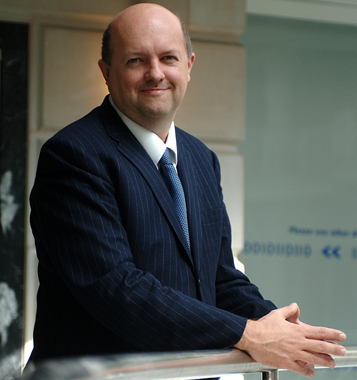 He moved to Ireland after cooking in England for seven years, being originally from Cognac. 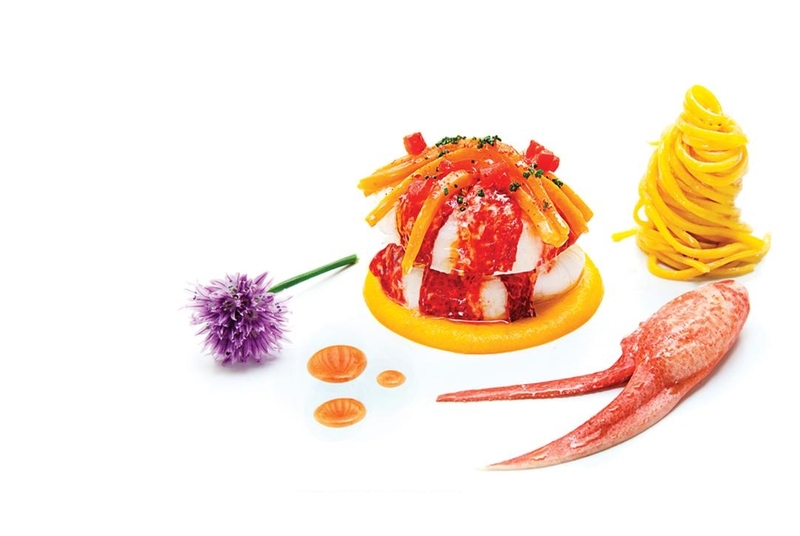 These days the kitchen is in the hands of Guillaume Lebrun, who has worked here since the opening of the restaurant, after previously cooking in Paris. The restaurant is on the ground floor of a boutique hotel in central Dublin. The room is airy and bright, with a high ceiling, patterned carpet, white walls and beige upholstery. The room can seat 70 diners at capacity, and there is a private dining room in addition. Fourteen chefs and three kitchen porters were working in the kitchen today, to give a sense of the chef/diner ratio. There was a three course lunch available for €50, a four course tasting menu at €90 but I went for the full-blown eight course tasting menu at a not inconsiderable €165. The wine list lands with a thud on the table in a large black binder. The cellar has around 20,000 bottles in all, with over 1,200 separate wines listed. Mark-ups seemed generally moderate. Example wines were Guilhem and Jean-Hugues Goisot Algote 2009 at €38 for a wine that you can find in the high street for €14, Cuvée Frederich Emile 2004 at €76 for a wine that retails at €46, and Michel and Stephane Ogier Cote-Rotie 2008 at €110 for a wine that will set you back €49 to buy. There were plenty of grander wines, including some bargains such as the superb Guigal La Turque 1999 at €405 for a wine that actually costs an average retail price of €691. Mineral water was a hefty €6. As I glanced through the wine list a trio of neatly piped Parmesan gougeres appeared: these were light, with a liquid centre, though personally I prefer a little stronger cheese flavour in my gougeres (17/20). A large bread basket was filled with a wide range of breads, which are warmed up here, though the dough is supplied from an outside facility. The selection included baguette, bacon and onion roll, ciabatta, walnut and raisin roll, mixed seed bread and soda bread. These were good without being dazzling (from 16/20 to 17/20). 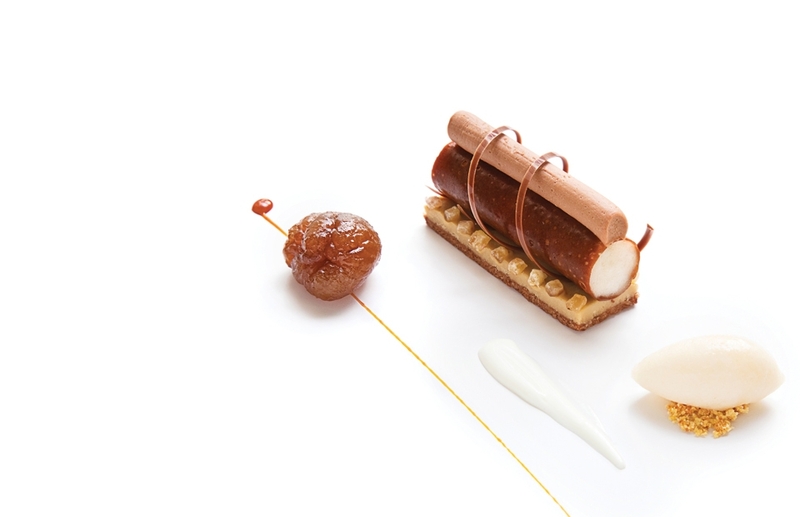 The meal began with pan-roast duck foie gras, with pickled cherry, smoked almonds, almond milk and a little almond biscuit on top of the foie gras. The liver itself was top class, with deep flavour and smooth texture, the cherries adding a little acidic balance, the almonds an additional dimension of texture (18/20). This was followed by a single large roast scallop (from Castletownbere) with little cubes of parsley jelly, a light garlic emulsion and a Pedro Ximenes reduction. The scallop was high quality, caramelised with the help of a little sugar, cooked in butter and oil, and was cooked very carefully through (18/20). Next was a tarte fine of assorted raw and marinated vegetables, on a base of St Tola, a soft goat cheese from County Clare, with a red pepper mustard. The peppers, radish, cucumber and baby mushrooms went well with the cheese, the red pepper mustard was a nice touch and the tart layer had good texture, but this sort of dish lives of dies by the quality of the vegetables, which to be honest were merely good (16/20). This was followed by blue lobster (from Annagassan), with butter radish, lime and green apple jus and green cabbage. This was an impressive dish, the large piece of lobster beautifully cooked and having lovely flavour, the lime flavour providing just a touch of acidity but nicely controlled, the cabbage balancing the lobster: classy cooking (19/20). This was followed by poached and roasted wild squab with a "Nepal" sauce that had a hint of Szechuan pepper. This was served with good quality green asparagus. The duck, which I gather was from Brittany, was cooked carefully and had good flavour. The sauce was interesting: Szechuan peppercorns have a numbing effect but here they were carefully controlled (17/20). A cheese board had quite a wide choice of cheese, some from Ireland (such as Gubbeen) and some from France (Brie de Meaux, Munster etc). The hard and soft cheeses were in reasonable condition but the goat and blue cheeses were visibly past their best e.g. a poor St Maure de Touraine. I suspect that they do not sell quite enough cheese so are tempted to leave the cheese too long, but I think they would be better to have a smaller board with cheeses in prime condition (barely 15/20). As a nice touch, the helpful sommelier brought, instead of a single glass of wine, four little glasses of different wines paired with each cheese that I had selected. Pre-dessert was Granny Smith apple parfait with pistachio ice cream, and Bourbon vanilla foam, with little pieces of delicate meringue. This was a pretty dish garnished with a loop of spun sugar, and worked well. The apple parfait had excellent texture and flavour, the meringue adding an extra texture to the dish, the vanilla espuma good (18/20). This was followed by dark chocolate tart with Bourbon vanilla ice cream, prettily and precisely plated and with excellent depth of flavour and good pastry (18/20). Coffee was accompanied by an array of petit fours: chocolate truffle, a little bar of milk chocolate, white chocolate and strawberry, a little chocolate with a liquid centre of raspberry and lime coulis, strawberry macaroon, cannoli, blackberry tartelette and a pineapple and thyme financier. The chocolates were particularly well made (overall between 17/20 and 18/20). Service was very professional, if a little stiff at the beginning of the meal. One waiter turned out to have worked at Ledoyen and was particularly good, and the restaurant manager has worked here since the restaurant opened. Topping up was faultless. The bill, with three glasses of wine, came to €220 for myself, but of course I had opted for the full menu; it would be possible to eat for much less, especially at lunch. Overall this was a very fine restaurant, fully deserving of the two Michelin stars it had at the time of this review. The ingredient quality was high, the technique in the kitchen hard to fault, presentation was attractive and the dishes were sensibly composed. High class cooking.